1. As the steward of my soul, I am responsible for taking care of myself. At times, I have been passive about the care of my body, soul, and mind, maybe afraid to be selfish. But I'm learning in the book Boundaries by Doctors Henry Cloud and John Townsend** that "appropriate boundaries actually increase our ability to care about others. People with highly developed limits are the most caring people on earth." While it's God's plan for me to be in community and depend on and support others, only I know how my life feels and how it affects my heart (see Proverbs 14:10), so I am the one ultimately responsible for its care--as I abide in Christ. I want to better care for my life so that I can be used by God in the lives of my people around me. 2. I must be face my weaknesses. I read in my devotional (New Morning Mercies by Paul Tripp**) yesterday morning that when we fail to face our weaknesses, we are basically saying, "I don't want to be who I am or face who I am." I certainly don't like facing my weaknesses. I want to be able to do it all, and do it well, and for everyone to be happy with me, but this is not the life God has called me to or given me strength for! 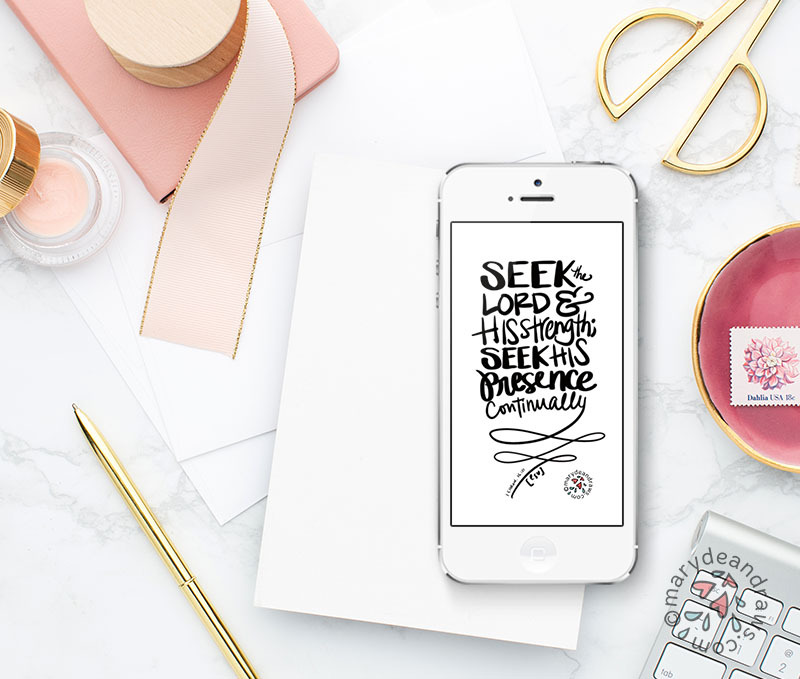 Tripp writes that "the great danger is your delusion of strength, because if you think you're strong, then you don't seek the help that you desperately need from the One who is the ultimate source of strength of every kind." These are the lessons I'm learning right now. One outcome is that we have enrolled our girls in the local public school and taken a break from homeschool. It breaks my heart a little to give it up, but the girls came home happy and excited from their first day yesterday, and God has given them the sweetest teachers. This is one way I am trying to establish healthy boundaries and accept my weaknesses this year. I am dreaming of things to create and share with you this coming year. I hope you'll follow along! 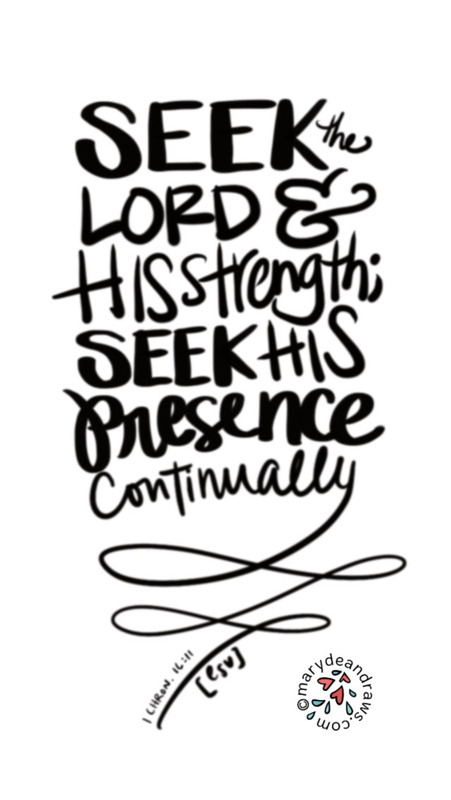 For now, I'm sharing this hand-lettered phone screensaver of 1 Chronicles 16:11. 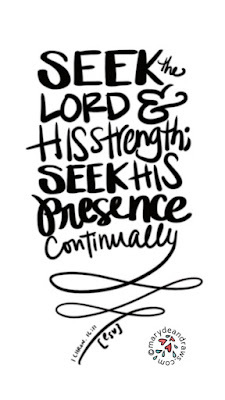 What better way to enter a new year than to be determined to "Seek the Lord and his strength [and] His presence continually"? To download, click on the image below and save to your device! ** “We are a participant in the Amazon Services LLC Associates Program, an affiliate advertising program designed to provide a means for us to earn fees by linking to Amazon.com and affiliated sites.” Bascially, if you purchase something using these links, I get a small portion of the sale. It's a small way you can support the blog if you'd like. Thanks! Thank you! Looking forward to following along with you. Good for you, dear friend. I'm inspired by your strength in weakness, your listening attentively amidst the noise of life, and your tending your fence so you have a place to healthily invite others in.